9 HOW DO WE NARROW THE DIFFERENTIAL? 10 WHAT IS OUR THRESHOLD FOR DIAGNOSING THIS CONDITION? 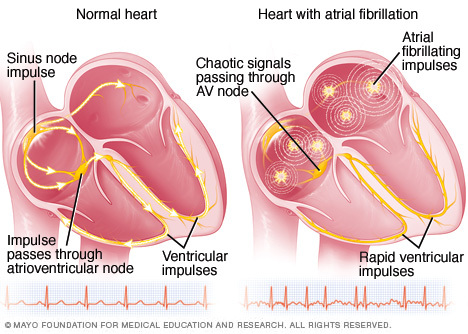 Atrial Fibrillation (commonly referred to as “A-fib”) is a cardiac dysrhythmia (more precisely it is a supraventricular tachyarrhythmia) that is characterized by uncoordinated atrial activation and an associated irregular ventricular response. It can either be chronic or acute in nature. Decreased cardiac output: a synchronized atrial contraction is important to the proper filling of the cardiac ventricles. In the setting of atrial fibrillation the ventricles are not properly filled, and by extension, the cardiac output of the heart can be diminished. Clot formation: blood can remain pooled in the atria due to the loss of a coordinated contraction. This stagnant blood can coagulate forming clots that can embolize and travel to different parts of the body (causing ischemic attacks/strokes/etc). Irregularly irregular heart rhythm can be detected when checking the pulse. Irregularly irregular heart rhythm can be detected during auscultation. Serum TSH: can be evaluated to workup other causes of heart palpitations, or try to uncover the underlying etiology of the suspected/diagnosed atrial fibrillation. Rapid oscillatory (fibrillatory) baseline: waves can vary in amplitude, shape, and timing. Transesophageal echocardiography: this study can be used to evaluate for the presence of appendage thrombus and also aid efforts to cardioavert patients who are not taking oral anticoagulants. EKG findings consistent with atrial fibrillation are generally required for the definitive diagnosis of atrial fibrillation.